Copyright © Brian Kosnar - Mineral Classics - This image is copyrighted. Unauthorized reproduction prohibited. Specimen Size: 7.0 x 6.6 x 2.8 cm. A polished slice (cross section) of Quartz (var: "Ametrine") showing the alternating zones of rich purple and yellow that exist within these natural bicolor crystals. 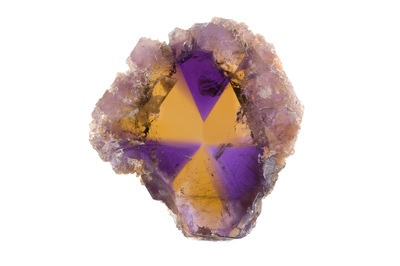 It should be noted that the purple "Amethyst" portion of the crystals show strong Brazil-law twinning, while the yellow "Citrine" areas do not show any twinning at all. This piece is one of the cleanest, gemmiest and thickest slices that we have seen. It was only one of only a handful of mineral specimens that my father had on display in the house when I was growing up. Photo by Brian Kosnar. Kosnar Family Collection.